I love lake weddings! This one I was unfortunately not able to get out to (they had everything picked up and brought it out to the lake themselves), but just being able to look at the photos and imagine the scent of the pines and beautiful, reflective quality of the water and it just feels so peaceful, doesn't it? Originally, Krystyl wanted to go with a white and green scheme, until she came across an inspiration image that warmed and deepened that colour palette up a bit - sandy blushes, warm neutrals, and burgundy plums. I am really fond of the way it all came together! Bridal Bouquet Ingredients: peonies, quicksand and sahara roses, brown lisianthus, scabiosa and ranunculus, with ninebark foliage, olive, rosemary, and silver dollar eucalyptus. The bridesmaids all wore different white dresses, which looks so crisp against the verdant greens and bright bluey greys of the water. And I had to include one of the handsome guy below, my brother-in-law, Chad! They always hoped that they'd be able to have the ceremony outdoors, and I'm so glad that they were able to in the end. This is about as "beachy" as you get in the Whiteshell, and instead of sand, you get stone :) They built this gorgeous wood arbor for their ceremony and I loved Krystyl's idea of hanging a macrame wall hanging on it. We added an asymmetrical garland, along with some loose blooms in the burgundy, blush, and white palette. I have to thank my sister, Carmen (who is one of Krystyl's good friends) who set this all up for us! While working on it, she texted me: "you have the worst job." ha! The camp has long banquet tables, which worked great in the space. Krystyl chose to keep the tables more neutral, alternating greenery on some of them and florals with rattan table runners (which they made from Ikea mats!). The copper flatware made an ENORMOUS difference and just makes the overall room design feel so customized. Looking for a wedding florist in Winnipeg or Lake of the Woods? Getting married in Manitoba or out at the cabin? I might be biased, but flowers are the best way to make a statement at your wedding. 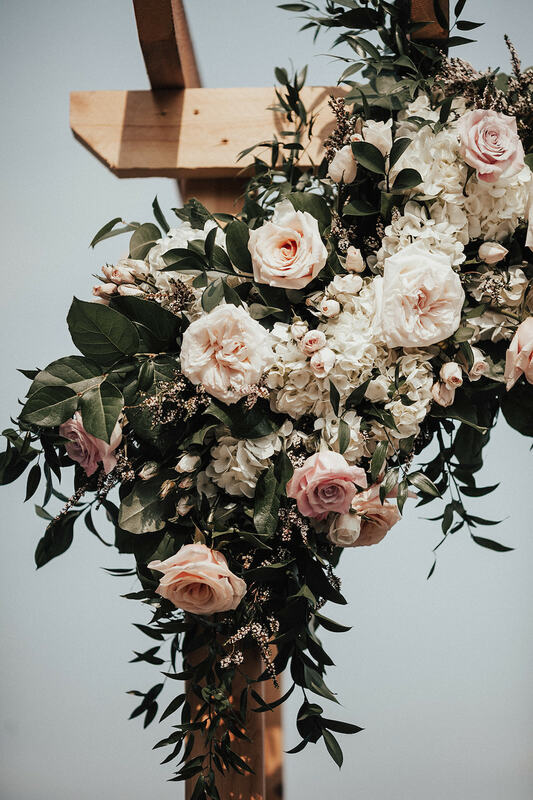 Whether you already have a specific vision or want me to dream up something custom just for you, reach out to Stone House Creative for stunning bridal bouquets, truly unique ceremony backdrops, and beautiful floral centrepieces to create the perfect ambiance for your wedding!